What's hot in hort in the Southeast! New Home (and Growing Season)! Many of you already know, but I have recently relocated to beautiful Birmingham, Alabama! While NJ and the mid-Atlantic region will always hold a special place in my heart, it's great to be back home with one of the longest growing seasons in the US (even as we head into the sweltering heat and humidity that is an Alabama summer). Along with exciting new growing opportunities, horticulture in the southeast region also presents an array of new gardening challenges. From spiking temperatures to severe thunderstorms, from extended drought to packed clay soils, I know some lessons will be hard-learned. I'm here to share with you my experiences both good and bad in the garden, so be sure to check back frequently! To kick off my adventure, let's start with a great question I've heard frequently of late: what should I plant and when? Of course, like snow flakes (which this region saw an unusually high amount of this past winter) no two growing seasons are the same. However, the Alabama Cooperative Extension Service (ACES) has a detailed chart (found here) that will serve as a great general guide in planning your garden. Has the spring planting date for your favorite veggie already passed? Don't despair! Most will have a suggestion for fall planting dates as well. Wondering when you'll be able to eat the tasty treats you grow? Just count forward from your planting date by the given days to maturity to find your approximate harvest date! As always, be sure to have a current soil evaluation before fertilizing or planting! In Alabama, ACES soil testing kits are extremely affordable and available from a variety of locations. Contact your local Alabama Master Gardener Helpline to find a location convenient to you. The weather outside may be frightful, but there’s still plenty of gardening related tasks to be accomplished during the winter season. Here are some things that can be done over the next few months in order to prepare for a successful gardening season to come. Help prevent damage to outside plants by gently brushing snow off of heavily laden shrubs and trees to prevent breakage and avoid burying shrubs and perennials when shoveling or blowing snow. Prune dead, diseased, or damaged wood on trees, shrubs & vines as soon as it is observed. A few minutes of tidying up now can save time later and give you some winter exercise. Add organic material to the compost pile or bin. Avoid walking on frozen lawns as it can break grass blades and damage crowns of the plants. Stick to driveways, sidewalks, and walking paths. Bare soil invites winter weeds into the garden. Cover bare areas with mulch and pull any weeds that appear to prevent them from going to seed in the spring. Monitor evergreens for bagworms sacks and remove them if found. Clip them off and bag them up to be disposed of with your household trash. Do not compost them. Bagworms can be highly destructive to trees such as arborvitae, spruce and cypress so clip the 1-2” sacks now to prevent the hundreds of eggs from hatching in the spring. Provide food and habitat for winter wildlife by keeping bird feeders and birdbaths filled throughout the season. You may even consider a birdbath heater which will keep the water just above freezing and available to wildlife that will desperately need it. Wait to cut back shrubs and perennials until the spring so that wildlife will have some winter cover. This will also increase the visual interest in your garden throughout the season. Read gardening books and magazines and plan for next year’s garden designs. Plant bulbs until the ground freezes or during a thaw or store in the refrigerator. Cut evergreens for fresh, indoor decorations. Keep firewood outside until 1-2 days before burning to prevent critters from waking up inside your home. Order seeds for next season. Clean & disinfect pots & containers. Have your soil tested before purchasing or applying any fertilizers or soil amendments. Also, don't neglect your trusty tools! Here are some tips on caring for your tools this winter so they'll be at their best when you need them next season. Check hoses and sprinklers for leaks. Small leaks can result in large quantities of wasted water and higher utility bills. Drain, coil & store hoses in a dry, protected area where they will not freeze. Remove any soil, vegetation, or rust from all tools using a strong stream of water, a wire brush, or scraper. Grill cleaning brushes work great for this task. Lubricate all tool pivot points and springs. Sharpen hoes, spades, loppers, pruners, and saws. Check all tools thoroughly for loose screws or nuts and tighten them accordingly. Replace or repair broken handles and other bent or broken parts. Spray all bare metal parts and cutting edges with a penetrating oil to prevent rust. Sand wooden handles smooth and wipe with boiled linseed oil to help prevent wood from cracking and drying or paint handles a bright color for quick and easy location in the garden. Repair or replace any tools with bent blades or teeth. All sprayer parts should be thoroughly washed and rinsed before storing. Most pesticide labels recommend a triple rinsing of sprayers. Oil any moving parts as instructed in the owner’s manual. Store sprayer upside down to allow it to drain and dry thoroughly. Store any chemicals out of the weather where they will not freeze. Check chemical labels for expiration dates. If expired, dispose of them as hazardous waste. Clean wheelbarrows, carts, and wagons thoroughly and remove and rust before touching up paint chips with spray paint to prevent rust in the future. Check tire pressure, inflate if needed, and grease wheels to keep them rolling smoothly and prevent squeaking. Store in a dry area. Clean and service lawn mowers and other power equipment such as tillers, chippers, trimmers, or weed eaters according to the instructions in the owner’s manual and store in a dry area. Avoid storing gasoline over the winter as old gasoline does not ignite easily, making the machines using it work harder, and often leading to frustration getting them to start. If you do store fuel, be sure it is in a will ventilated area away from your dwelling space. For those of you working in the garden or field this week, you're probably already aware that our area is under an excessive heat warning until at least mid-week, with temperatures in the high 90's and heat index values reaching into the 100's. Please don't take this lightly. Heat can kill! If you're spending time outdoors, be sure you know the signs of heat related illness and take the proper measures to avoid it all together. 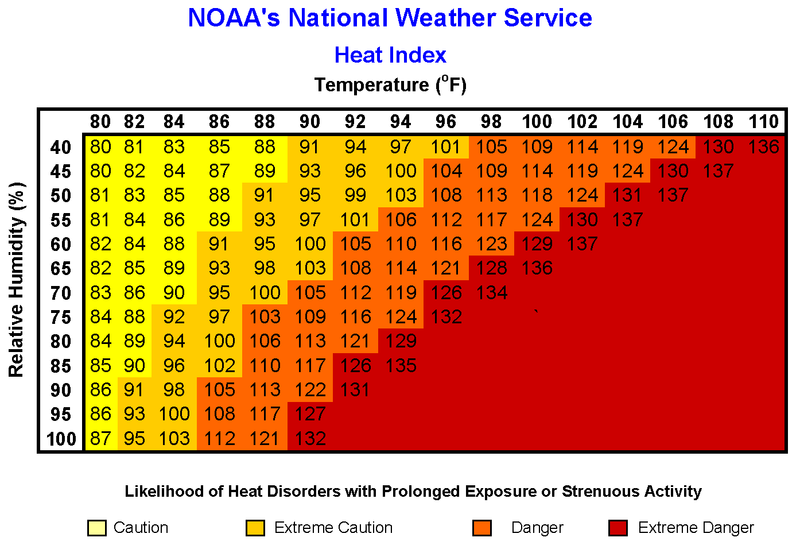 The National Weather Service has a great article on the subject so check it out and learn how to be prepared here: NWS Heat: A Major Killer. I hate to be the bearer of bad news but late blight, the disease caused by the fungal-like pathogen Phytopthera infestans, has been confirmed on a farm in Mercer County, NJ. This is the first confirmed case of the disease in NJ for 2013. This devastating disease of tomatoes, potatoes and other solanaceaous plants is notorious for it's ability to quickly wipe out entire crops, from a few plants in a home garden to entire commercially cultivated fields, putting farmers at serious financial risk. Remember the Irish Potato Famine back in the mid 19th century? Yup, that was late blight. So if you're growing tomatoes in any capacity this year, I can't encourage you enough familiarize yourself with the symptoms of this disease, to check your plants at least twice a week (more frequently when the weather is as wet as it has been lately), and destroy diseased plants immediately. If you're growing tomatoes and visit any other gardens or farms also growing tomatoes, especially any "you pick" fields, be sure to clean your hands, clothing, gloves, shoes and any tools used with hot, soapy water between locations to help prevent the spread as well. For more information from Cornell University on late blight, including how to identify infected plants, go to http://nysipm.cornell.edu/publications/blight/. Not sure if you have late blight or not? Reach out to your county's Rutgers Master Gardener Helpline. For Burlington County, contact the RMG Helpline at (609) 265-5050 or mgburlingtoncounty@gmail.com. 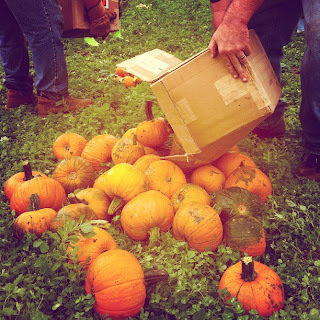 For other counties in NJ, check here: http://njaes.rutgers.edu/mastergardeners/helplines.asp. For other states, check with your state land grant university cooperative extension program. Late blight on mature green tomato fruit. Rutgers Master Gardeners of Burl. Co. Spring into Action! Well, it seemed as if it may never come, but spring finally made an appearance in Burlington County and now, following a frost two weeks ago, this week it's feeling more like summer! 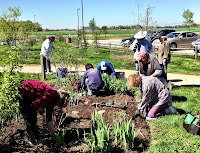 The Rutgers Master Gardeners of Burlington County (RMGBC) and I have been hard at work, wrapping up our 2013 Initial Training Program, opening the growing season with the 2nd Annual Burlington County Garden Expo, and getting our eager hands into the soil at our many projects throughout the county. 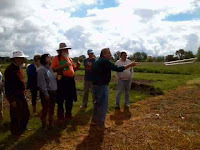 Our training wrapped up with our annual tour of the Rutgers EcoComplex where Pat Evans told us all about how their bio-reactor landfill system works, and Russel Wright lead our group through the state-of-the-art research and demonstration greenhouse. During these tours we learned how the energy demands of the greenhouse are met through the capture and utilization of gases from the landfill, as well as about the incubator businesses operating in the greenhouse and how the aquaculture system provides nutrients to their growing plants through the recirculating hydroponic irrigation system. Even though most of New Jersey saw heavy rains and thunderstorms during the day, we managed to stay dry out at the Burlington County Community Agricultural Center (BCCAC) for the Garden Expo on Saturday, May 11. In addition to the "Ask a Rutgers Master Gardener" table, the RMGBC had a Ramapo tomato plant sale, led educational programs on subjects such as The Climate-Friendly Gardener, Flower Arranging: Thinking Outside the Vase, and Gardening to Protect Water Quality, as well as ran the Children's Make-and-Take activities for the day. Our Make-and-Take activities included potting up a few herbs and/or flowers as a Mother's Day gift for mom while learning about the importance of soils and making a radish seed necklace while learning the basics of how seeds germinate. 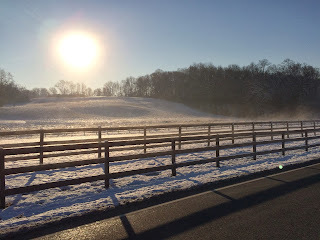 We all had a lot of fun and enjoyed the mild weather. Thank you to everyone who came out and helped to make this event a success! We've dug on in (ha!) to all of our community projects for the year as well, including our ongoing projects such as our Demonstration Plots and IPM Scouting Team at the BCCAC, Donation Garden at Medford Leas, our Kitchen and Blended Gardens at the Pinelands Preservation Alliance, and the Children's and Butterfly Gardens at the Rancocas Nature Center, as well as a new project working with the Eagle Scouts to help design a teaching garden at Evans Elementary School. Stay tuned for more updates on these projects as the season progresses! measuring thresholds for the IPM scouts. Installing a new cold frame at the Medford Leas Donation Garden. Well, here it is folks! The reason I always urge gardeners to wait until early April before seeding and early May before transplanting anything into the ground in Burlington County. 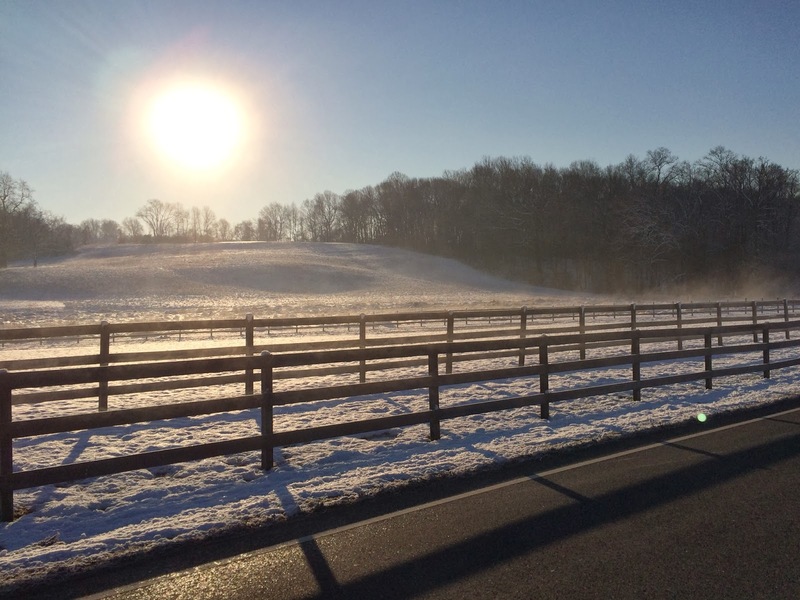 Think back to the second week of March when the sun was shining and it felt downright toasty topping 60 degrees outside. It seems a rather distant memory now as the snow continues to fall but back during that warm, sunny week the Rutgers Master Gardener Helpline phone here at RCE Burlington County was nearly ringing off the hook with callers anxious to know if it was safe to start their spring planting. As tempting as it was, even for myself, I towed the frost date line and cautioned everyone to wait. Aren't you glad you did? Yesterday we harvested our trial field for new winter squash varieties two hybrid stars really shone! The first is a new, round, pie pumpkin called 'Trickster'. It's very similar to the 'Prankster' variety, but we saw much more uniform orange color with the 'Trickster' as well as greater stem quality and a touch better disease resistance. The second, and a bit unexpected, winner was the 'Quantum' butternut squash. Wow, what a producer! High yield, amazing uniformity of color, size and shape with really nice, thick necks and, to be in a field with a fairly significant amount of both downy and powdery mildews present, it was virtually disease free. 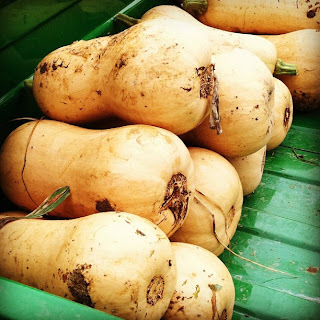 If you're considering new varieties of winter squash for your garden next year, it would be hard to go wrong with these!